NYE 2019 at Beer Park and Chateau Nightclub: 2 awesome outdoor venues, 1 HUGE party with 3hr Open Bar! Ring in the New Year under the iconic Eiffel Tower replica in Las Vegas. Panoramic skyline & Bellagio Fountain views. 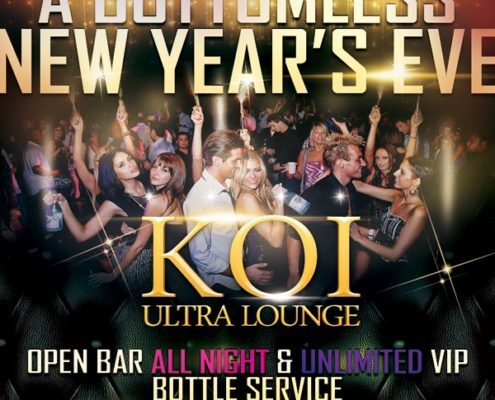 How about "A Bottomless New Years 2019” NYE at Koi Las Vegas? Located on the 50-yard line of Las Vegas Boulevard with a bird’s eye view of all the revelry and fireworks show. Tickets include 7hr Open Bar and party favors.